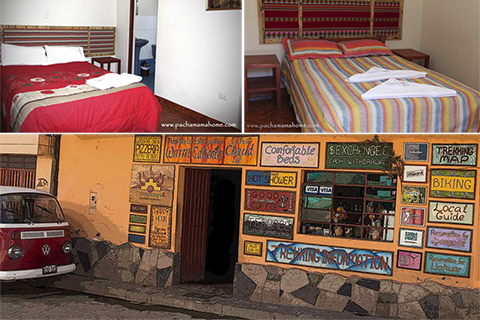 Pachamamahome is a nice family atmosphere hostel located right in the heart of Colca Canyon, in the traditional village of Cabanaconde (3, 287metres), 5 1/2 hrs. By bus from Arequipa city. We also have a quiet cozy Bar - Restaurant - Woodfired Pizzeria where is the perfect place to meet travelers and organize your hiking into the Colca Canyon. We will provide you valuable trekking information of Colca Canyon with an update trekking map and the most important is that we help you to plan a safe trekking in Colca Canyon. We invite you to explore Colca Canyon in a different way by visiting Cabanaconde and its surroundings. 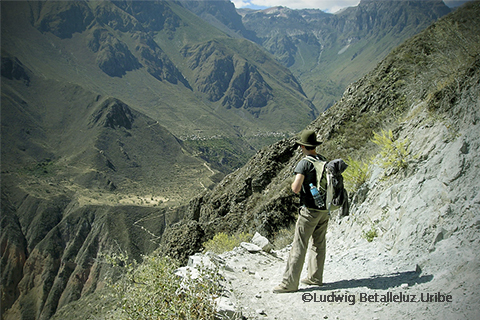 Most of the trekking trails in Colca Canyon start from the traditional village of Cabanaconde. There are several trekking options according your needs starting from 1 to 5 days. You can also enjoy by doing short hikes, biking from Cruz del Condor, visiting Viewpoints to observe the depth of Colca Canyon or ride a mule to Kallimarka ruins. More information for trekking in Colca Canyon. How to get to colca canyon from Puno - Cusco to Colca Canyon?. We can book the service with 4M, daily departures from 1:00 p.m. to Chivay. 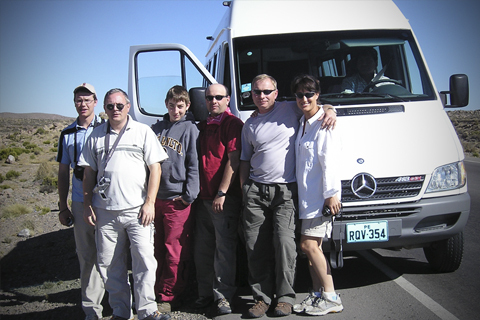 We will help you with the connections from Cabanaconde - Chivay. 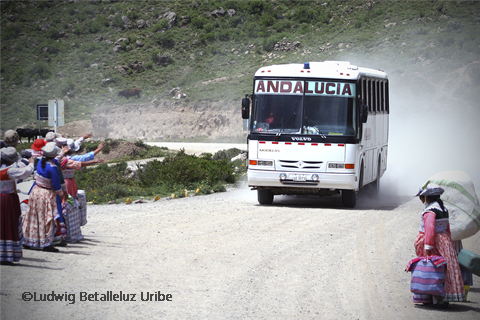 This bus saves you much time and you enjoy the scenery of the Andes on the way to Puno. You can purchase and ensure your bus tickets in advance. 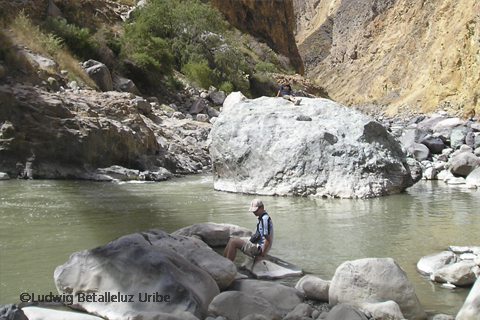 Save time and feel more tranquil and quiet during your trip to Colca Canyon. More information about buses from Arequipa to Colca Canyon. Enjoy Biking from Cruz del Condor downhill to Cabanaconde. We offer you a different way to visit the most famous viewpoint for Condors. 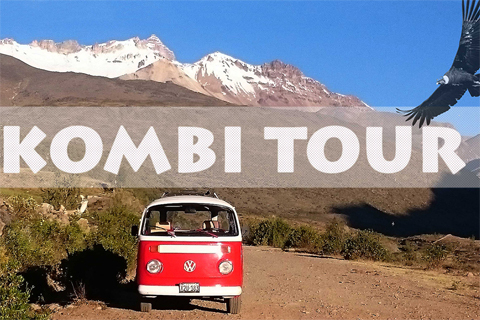 Visit with our Kombi Volskwagen the viewpoint of Cruz del Condor. We always depart early and be the first to see Condors, we also have chances to see condors at the Viewpoint of Tapay. How to get from Arequipa to Cabanaconde?. How to get from Cabanaconde to Arequipa?. You can check the updated bus schedule from Arequipa, Chivay and Cabanaconde. 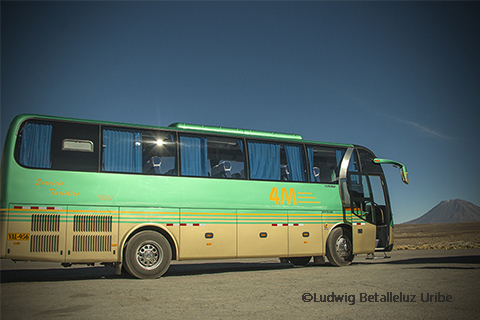 The most updated schedule bus from Arequipa to Colca Canyon - Chivay - Cabanaconde. 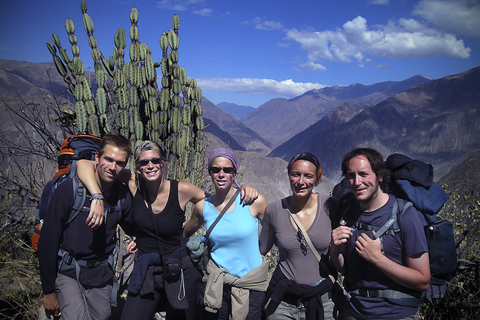 We offer a different experience with alternatives trekking options into Colca Canyon. 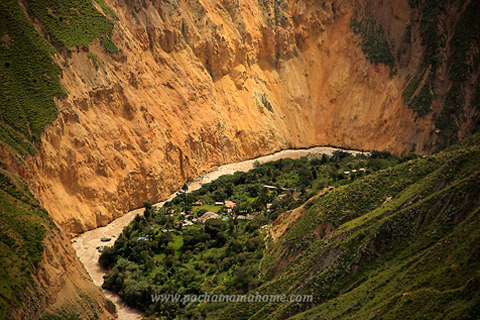 Pachamama can help you to make reservations for family homestays that are found in Colca Canyon such as the villages of San Juan de Chuccho, Tapay, Sangalle (Oasis) and lodge at Llahuar. We can make your booking in advance through our website especially if it is high season. Sangalle (Oasis) this is the most popular trek of 1 day trekking from Cabanaconde to the bottom of the Canyon . Sangalle is a small piece of land situated at the bottom of the canyon the view and the color of the mountains are impressive. There are five places to stay and most of them offers bungalows. The most classic trekking for Colca Canyon is the trekking to San Juan de Chuccho and Sangalle, you can hike for 2 days and spend 1 night or why not 2 nights. You will also hike through the villages of Coshñirwa and Malata. Enjoy swimming in the pools of Sangalle. This is definitely one of the best alternatives hikes in Colca Canyon. 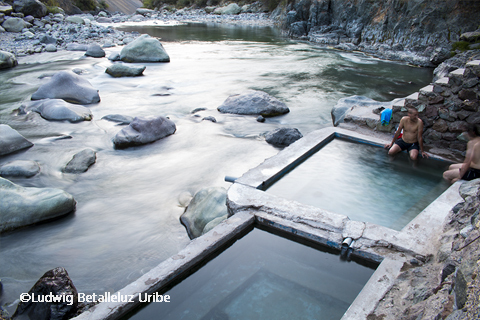 Llahuar is a very quiet place and offers hot springs on the banks of the Colca river. This trek is a bit longer and you may need 3 days 2 nights. 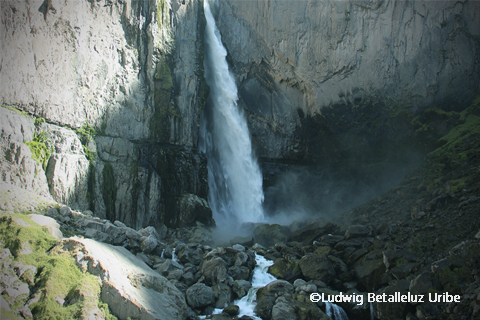 The best alternative trekking that offers great views of Colca Canyon is the hike to Fure and Huaruro´s waterfall. You will rarely see other hikers on the trails. If you look for something different this might be your trek. You need 3 to 4 days to enjoy and you must hire a local guide. 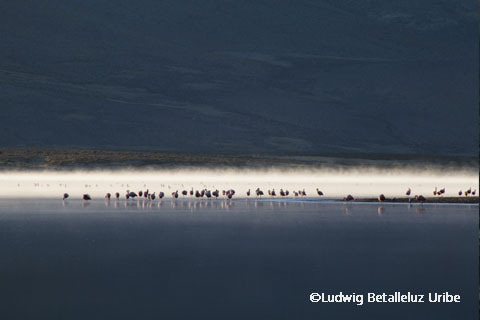 If you are in Cabanaconde you can visit the lagoon of Mucurca, great views and flamincos. You get the best views of the Volcanoes Ampato, Sabankaya and Hualca-Hualca. 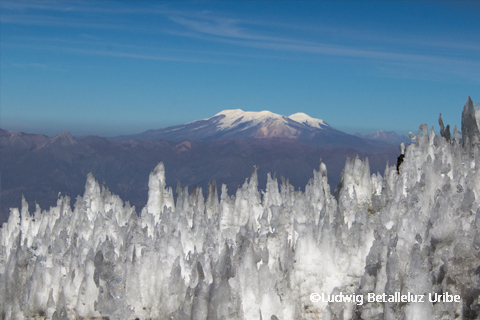 If you love climbing we can offer you a great experience by climbing the snow capped mountain of Hualca-Hualca 6 025 m. This Tour is only organized by Pachamama.